Dengue viral infection (DVI) is one of the most important mosquito-borne diseases in the world. In India, the first proven epidemic of dengue fever (DF) occurred in Kolkata in 1963–1964. With rapidly changing epidemiology, the footprint of DVI has dramatically expanded over the past few decades. At present, all the four serotypes are seen, but the predominant serotype varies with time., The clinical spectrum of DVI ranges from self-limiting illness to life-threatening dengue hemorrhagic fever (DHF) or dengue shock syndrome (DSS). Several mechanisms have been proposed for DF-induced acute kidney injury (AKI), including direct action by the virus, hemodynamic instability, rhabdomyolysis, and acute glomerular injury. Previous studies have shown great disparity in the incidence of dengue induced AKI ranging from 0.83% to 13.3%.,, In most of the previously conducted studies, AKI incidence was reported in patients with DHF,,,, and only few studies have reported the incidence of AKI in DVI.,,, Given the epidemic potential and endemicity of DVI in India, the aim of this retrospective study was to evaluate the incidence, clinical characteristics, severity, predictors of AKI, and impact of AKI on the length of hospital stay and mortality in DVI. At least 4-fold increase in dengue-specific hemagglutination inhibition titers in convalescent serum when compared with acute phase serum. As per World Health Organization (WHO) criteria, patients with DF and hemorrhagic manifestations, low platelet count (≤100 × 103/μL), and objective evidence of leaky capillaries (≥20% elevation in hematocrit, low serum albumin, and pleural or other effusions) were classified as having DHF (WHO classification, DHF grades I/II). Those with evidence of circulatory failure (pulse pressure ≤20 mmHg, hypotension, or shock) were classified as having DSS (WHO classification, DHF grades III/IV). Warning signs were defined as presence of at least one of the following: abdominal pain/tenderness, persistent vomiting, clinical fluid accumulation, mucosal bleed, lethargy/restlessness, liver enlargement >2 cm, and concurrent increase in hematocrit with thrombocytopenia. AKI was defined as per Acute Kidney Injury Network (AKIN) classification. Renal outcome was defined according to Acute Dialysis Quality Initiative consensus guidelines. Complete renal recovery was defined as a return to baseline creatinine and a partial recovery as an improvement in RIFLE status of a patient free of dialysis. Hospital stay was defined as >1-day bed occupancy in hospital, mortality as death within 14 days of admission, hypokalemia as serum potassium <3.5 mmol/L, and hyponatremia as serum sodium <135 mmol/L. Urine output was measured by indwelling catheter in hemodynamically unstable patients/unconscious patients, and oliguria was defined as urine output <400 mL/day after 24 h of appropriate hydration. Hypotension was defined as blood pressure <110/70 mmHg, proteinuria as urinary protein ≥1+ (30 mg/dL) by dipstick test, and microscopic hematuria as >5 RBCs/HPF. Urinary sediment was defined as the presence of glycosuria, hematuria, proteinuria, leucocytouria, urine pus cells, and/or urine epithelial cells; anemia as Hb <12 g/dL; dengue viral infection as DF, DHF, or DSS; severe dengue as DHF or DSS; mild AKI as AKIN-I; severe AKI as AKIN-II or AKIN-III; and multiple-organ dysfunction as dysfunction of >2 organs, including AKI. The patients were divided into two cohorts (those with and without AKI) to determine independent predictors of AKI. Similarly, two cohorts were also made to study the impact of AKI on the length of hospital stay. Data pertaining to age, gender, comorbidities, laboratory investigations, and mortality of each patient were obtained from medical records. An automated blood-cell analyzer (Abbott Cell Dyn Ruby Hematology Analyzer; Abbott, Abbott Park, IL, USA) was used for routine hematology testing, and an automated clinical biochemistry analyzer (Elitech Selectra PROM) (ELITechGroup, Puteaux, France) was used for measurement of blood urea nitrogen, creatinine, electrolytes, serum bilirubin, and albumin. Proteinuria was measured by dipstick test (Sidak Life Care Pvt. Ltd., Peera Garhi, Delhi, India). Categorical variables were presented as percentages and compared using χ2 test. Fisher's exact test was used when the expected count was less than five in any cell. Quantitative data were expressed as mean ± SD. One-way analysis of variance was used to compare the mean values among various groups in case of normally distributed data. Quantitative variables with non-normal distribution were compared by Mann–Whitney U-test between groups. Odds ratio (OR) and their 95% confidence intervals (CIs) for the predictors of AKI were estimated using multivariate logistic regression analysis models. 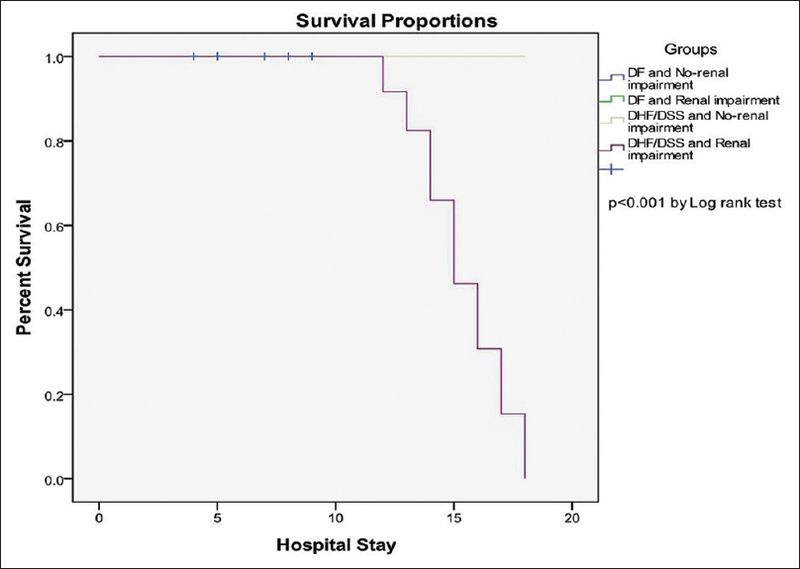 Kaplan–Meier analysis was used for probability of survival among groups with DF and DHF/DSS with or without renal impairment with the period of follow-up taken from the day of hospitalization till the day of patient discharge. Mortality among patients was taken as the event of interest. The criterion of significance was set at p < 0.05. All calculations were carried out using Stata IC 13.1 software (StataCorp LP, USA). Among the 620 patients, 353 (56.93%) were male and 267 (43.06%) were female, with a mean age of 31.6 ± 12.8 and 29.6 ± 11.2 years, respectively. A total of 454 (73.22%) patients had classical DF, 141 (22.74%) patients had DHF, and 25 (4.03%) patients had DSS. The most common symptoms were fever followed by headache and pain in abdomen. We found significant differences in age (p = 0.007), gender (p < 0.001), dengue classification (p < 0.001), underlying diseases (p < 0.001), rhabdomyolysis (p < 0.001), and urinary sedimentations (p < 0.001) between AKI and non-AKI groups. Among all AKI cases, hypokalemia was observed in 28.22% of patients, while oliguria was present in 46.77% of patients. Comorbid diseases, for example, diabetes mellitus (p < 0.001), hypertension (p < 0.001), and ischemic heart disease (p < 0.001) were more commonly found in patients with AKI. The mean duration of illness in AKI and non-AKI groups was 5.94 ± 0.82 and 2.24 ± 0.76 days, respectively. 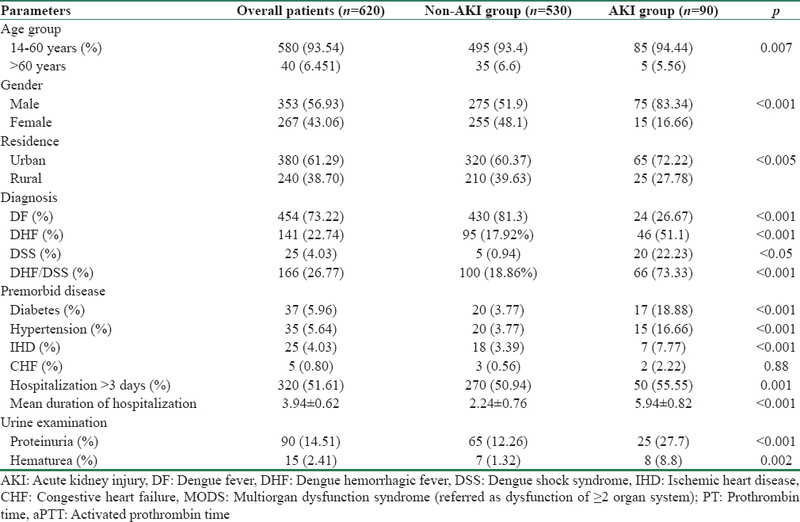 Patients with DHF/DSS were more prone to develop AKI when compared with the DF group (73.33% versus 26.67%) [Table 1]. Ninety (16.3%) patients developed AKI in this study; 31 (34.4%) patients had AKIN stage 1, 33 (36.6%) AKIN stage 2 and 26 (28.8%) AKIN stage 3 [Table 2]. During hospital stay, 11 (12.2%) patients progressed to a different stage (six patients from stage I to II and five patients from stage II to III). Dialysis was required in 20 (22.23%) subjects with AKI, out of which 14 patients died after two to three dialysis sessions. Among patients who died, only three patients died of secondary infection. The remaining 11 patients died of shock as a result of either intractable bleeding or severe DHF/DSS-induced multiple-organ failure (MOF). No one died as a result of complications of AKI [Table 3]. Among patients with AKI who were alive at the time of discharge from hospital, 75 patients (83.33%) had complete recovery of kidney function and only 15 (16.66%) continued to have some degree of renal dysfunction. Kaplan–Meier survival analysis was based on total survival days from the day of admission to discharge, among patients with DF or DHF/DSS in the renal impairment group and non-renal impairment group. Patients with DHF/DSS in the renal impairment group had significantly higher mortality when compared with other groups by log-rank test (p < 0.001) [Figure 1]. Using multivariate logistic regression models, we found that the factors independently associated with AKI development were male gender (OR: 2.9, CI: 1.28–5.89), DHF (OR: 7.9, CI: 3.69–18.60), rhabdomyolysis (OR: 8.2, CI: 3.14–21.52), multiple-organ dysfunction (OR: 18.2, CI: 9.24–36.24), hypertension (OR: 0.7, CI: 0.25–2.76), diabetes mellitus (OR: 4.8, CI: 1.15–18.97), delayed hospitalization (OR: 2.2, CI: 1.07–4.23), and use of nephrotoxic drugs (OR: 2.86, CI: 1.36–6.22) [Table 4]. In all, 320 patients (51.61%) had length of hospital stay of more than 3 days, whereas the remaining 300 (48.38%) had length of hospital stay of <3 days. We found that AKI was an independent predictor for increased length of hospital stay (OR: 7.2, 95% CI: 4.8–10.7) [Table 5] and [Figure 1]. Tropical acute febrile illnesses are common causes of AKI in developing countries. DF along with other tropical infections such as malaria, scrub typhus, and leptospirosis have been reported to cause AKI. There are multiple proposed mechanisms for the etiopathogenesis of renal impairment in DVI. Dengue causes capillary leakage and loss of fluid from the intravascular compartment leading to shock,, which may lead to decreased kidney perfusion and acute tubular necrosis. Deposition of immune complexes in glomeruli, hemolytic uremic syndrome, MOF, rhabdomyolysis or myositis, and direct viral invasion are some pathological mechanisms causing AKI in DVI. The presence of viral antigens in tubular epithelial cells has been demonstrated. This study compared all types of dengue infection with regard to the risk of developing AKI. Our analysis stratified patients on the basis of AKIN criteria. The incidence of AKI was 14.51% in our study cohort. Previous studies have reported incidence of AKI as 13.3% and 10.8% in dengue infection, irrespective of severity. This variation can be explained by differences in study design, the population studied, and definition of AKI used. Higher incidence of AKI in our study might be due to the selection of in patients as study population and delayed referral. Approximately 40% cases were referred from rural areas where medical resources are deficient. In the five studies comparing patients with dengue with and without AKI, AKIN and serum creatinine >2 mg/dL were the two criteria used to stratify patients with dengue into AKI [Table 6]. Use of the latter definition might ignore AKIN-I cases that accounted for 34.45% of AKI cases in our study. Previous study reports suggested that DHF and DSS are associated with an increased risk for development of AKI., Our results have supported these findings. 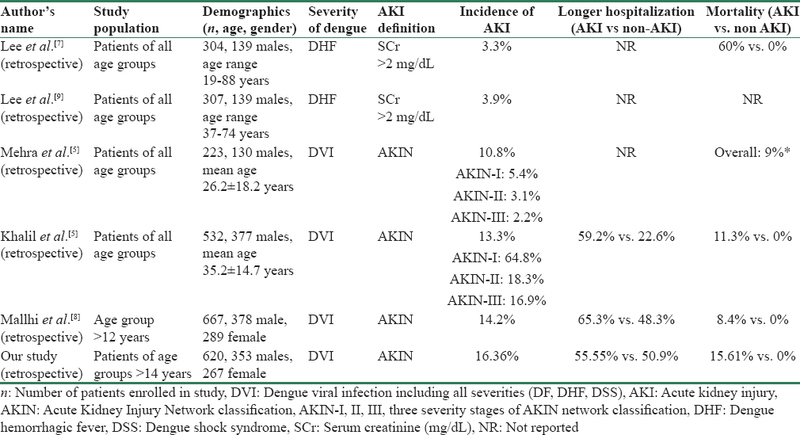 Among 90 patients with AKI, 66 (26.77%) had severe dengue (DHF and DSS), and logistic regression demonstrated that patients with severe dengue were more likely to develop AKI (OR: 7.9). Of 90 patients with AKI, rhabdomyolysis was present in 18 (20%) patients with OR of 8.2 and multiple-organ dysfunctions in 40 (44.45%) with OR of 18.2. Based on these findings, it can be hypothesized that AKI in our patients might be due to the presence of rhabdomyolysis, hemolysis, hypotension, multiple-organ dysfunction, or severe dengue (DHF and DSS). Male gender was overrepresented in our study and had a higher risk of developing AKI. Increased mobility of male population (OR: 2.9) and better access to healthcare facilities could explain the higher incidence of dengue infection and AKI among males. The use of nephrotoxic drugs (45, 50%) was also significantly (p < 0.001) higher in patients with AKI. Approximately half of the patients with AKI were using nephrotoxic drugs for their comorbidities. These agents impair the critical autoregulation of renal blood flow and result in ischemic AKI. Our findings suggested that patients using nephrotoxic drugs have 9.4 times more chances of having AKI when compared with non-users of these drugs. Therefore, optimal measures should be taken to avoid exposure to such drugs among patients with dengue. Dengue infection is associated with significant morbidity and mortality and imposes an enormous economic burden on the healthcare system of the country., The mean length of hospital stay in patients with dengue had been reported to be 3–4 days in various studies. Khan et al. from Saudi Arabia reported a length of stay of 4 days. Similarly, a study from Singapore reported the mean stay as 3 days. Parkash et al. reported a mean hospital stay of 4 days in patients with associated hepatitis. The mean length of stay in our study was 3–4 days, which is comparable with internationally reported data. Moreover, we found that AKI was associated with a longer hospital stay and hence is an independent predictor for length of hospitalization. We found that patients who were admitted on or after day 3 of illness had 2.2 times the risk of developing AKI. In such cases, early hospitalization may reduce the risk of AKI and deterioration of clinical condition. Besides these, early hospitalization among dengue patients may also reduce the risk of mortality and progression to severe dengue. Various studies have reported a mortality rate of 2.6%–2.7% in the general population infected with DVI., International data report a variable mortality rate ranging from 0% to 3.7%.,,, However, the impact of AKI on mortality in dengue is less well-studied. We found a significantly increased rate of mortality (15.61%) in patients with AKI, and interestingly no mortality in patients without AKI. Therefore, the presence of AKI in DVI predicts increased morbidity and mortality. The financial burden associated with DVI-associated AKI is of particular importance in a resource-limited setting such as ours. Kaplan–Meier survival analysis based on total hospitalization days from the day of admission to discharge, among patients with DF or DHF/DSS in the renal impairment group and in non-renal impairment group [Figure 1], showed that patients with DHF/DSS in the renal impairment group had significantly higher mortality when compared with other groups by log-rank test (p < 0.001). Kuo et al. have also shown that patients with DHF/DSS in the AKI group had significantly higher mortality than those without AKI. No specific preventive strategies are available for AKI apart from adequate fluid resuscitation, management of dengue-associated coagulopathies, and avoidance of nephrotoxic agents. Inotropic support is of benefit. Dialysis is certainly beneficial, although the exact role of dialysis remains controversial. This study had following limitations. Long-term follow-up after discharge is not available. AKI in dengue infection, is usually associated with significant morbidity and mortality. Patients with DVI who develop AKI should be vigilantly monitored preferably in a special care unit. The presence of AKI should alert clinicians to the need for admission and early initiation of supportive treatment under close monitoring to avoid morbidity and mortality associated with this complication. Gupta E, Dar L, Kapoor G, Broor S. The changing epidemiology of dengue in Delhi, India. Virol J 2006;3:92. Chakravarti A, Matlani M, Kashyap B, Kumar A. Awareness of changing trends in epidemiology of dengue fever is essential for epidemiological surveillance. Indian J Med Res 2012;30:222-6. Mehra N, Patel A, Abraham G, Reddy YN, Reddy YN. Acute kidney injury in dengue fever using Acute Kidney Injury Network criteria: Incidence and risk factors. Trop Doctor 2012a; 42:160-2. Bhaskar ME, Moorthy S, Kumar NS, Arthur P. Dengue haemorrhagic fever among adults – An observational study in Chennai, South India. Indian J Med Res 2010;132:738. Lee K, Liu JW, Yang KD. Clinical characteristics, risk factors, and outcomes in adults experiencing dengue hemorrhagic fever complicated with acute renal failure. Am J Trop Med Hyg 2009;80;651-5. Mallhi TH, Khan AH, Adnan AS, Sarriff A, Khan YH, Jummaat F. Incidence, characteristics and risk factors of acute kidney injury among dengue patients: A retrospective analysis. PLoS One 2015;10 e0138465. Lee K, Liu JW, Yang KD. Clinical and laboratory characteristics and risk factors for fatality in elderly patients with dengue hemorrhagic fever. Am J Trop Med Hyg 2008;79:149-53. Kularatne SA M, Gawarammana IB, Kumarasiri PRV. Epidemiology, clinical features, laboratory investigations and early diagnosis of dengue fever in adults: A descriptive study in Sri Lanka. Southeast Asian J Trop Med Public Health 2005;36:686-92. World Health Organization. Comprehensive Guidelines for Prevention and Control of Dengue and Dengue Haemorrhagic Fever; 2011. p. 196. Mehta RL, Kellum JA, Shah SV, Molitoris BA, Ronco C, Warnock DG, et al. Acute Kidney Injury Network: Report of an initiative to improve outcomes in acute kidney injury. Crit Care 2007;11: R31. Bellomo R. Defining, quantifying, and classifying acute renal failure. Crit Care Clin 2005;21:223-7. Basu G, Chrispal A, Boorugu H, Gopinath KG, Chandy S, Prakash JA, et al. Acute kidney injury in tropical acute febrile illness in a tertiary care centre – RIFLE criteria validation. Nephrol Dial Transplant 2011;26:524-31. George R, Liam CK, Chua CT, Lam SK, Pang T, Geethan R, et al. Unusual clinical manifestations of dengue virus infection. Southeast Asian J Trop Med Public Health 1988;19:585-90. Chacko B, John GT, Jacob CK, Vijayakumar TS. Dengue shock syndrome in a renal transplant recipient. Transplantation 2004;77:634-5. Wiwanitkit V. Acute renal failure in the fatal cases of dengue hemorrhagic fever, a summary in Thai death cases. Ren Fail 2005;27:647. Boonpucknavig V, Bhamarapravati N, Boonpucknavig S, Futrakul P, Tanpaichitr P. Glomerular changes in dengue hemorrhagic fever. Arch Pathol Lab Med 1976;100:206-12. Jessie K, Fong MY, Devi S, Lam SK, Wong KT. Localization of dengue virus in naturally infected human tissues, by immunohistochemistry and in situ hybridization. J Infect Dis 2004;189:1411-8. Schetz M, Dasta J, Goldstein S, Golper T. Drug-induced acute kidney injury. Curr Opin Crit Care 2005;11:555-65. Meltzer MI, Rigau-Perez JG, Clark GG, Reiter P, Gubler DJ. Using disability adjusted life years to assess the economic impact of dengue in Puerto Rico: 1984–1994. Am J Trop Med Hyg 1998;59:265-71. Okanurak K, Sornmani S, Indaratna K. The cost of dengue hemorrhagic fever in Thailand. Southeast Asian J Trop Med Public Health 1997;28:711-7. Lye D, Chan M, Lee V, Leo YS. Do young adults with uncomplicated dengue fever need hospitalisation? A retrospective analysis of clinical and laboratory features. Singapore Med J 2008;49:476-9. Parkash O, Almas A, Jafri SM, Hamid S, Akhtar J, Alishah H. Severity of acute hepatitis and its outcome in patients with dengue fever in a tertiary care hospital Karachi, Pakistan (South Asia). BMC Gastroenterol 2010;10:43. Kohli HS, Bhaskaran MC, Muthukumar T, Thennarasu K, Sud K, Jha V, et al. Treatment-related acute renal failure in the elderly: a hospital-based prospective study. Nephrol Dial Transplant 2000;15:212-7. Wasay M, Channa R, Jumani M, Zafar A. Changing patterns and outcome of dengue infection; report from a tertiary care hospital in Pakistan. J Pak Med Assoc 2008;58:488-9. Seet R, Ooi EE, Wong HB, Paton NI. An outbreak of primary dengue infection among migrant Chinese workers in Singapore characterized by prominent gastrointestinal symptoms and a high proportion of symptomatic cases. J Clin Virol 2005;33:336-40. Gonzalez D, Castro OE, Kouri G, Perez J, Martinez E, Vazquez S, et al. Classical dengue hemorrhagic fever resulting from two dengue infections spaced 20 years or more apart: Havana, dengue 3 epidemic, 2001–2002. Int J Infect Dis 2005;9:280-5. Wichmann O, Hongsiriwon S, Bowonwatanuwong C, Chotivanich K, Sukthana Y, Pukrittayakamee S. Risk factors and clinical features associated with severe dengue infection in adults and children during the 2001 epidemic in Chonburi, Thailand. Trop Med Int Health 2004;9:1022-9. Harris E, Videa E, Perez L, Sandoval E, Téllez Y, Pérez ML, et al. Clinical, epidemiologic, and virologic features of dengue in the 1998 epidemic in Nicaragua. Am J Trop Med Hyg 2000;63:5-11. Kuo MC, Lu PL, Chang JM, Lin MY, Tsai JJ, Chen YH, et al. Impact of renal failure on the outcome of dengue viral infection. Clin J Am Soc Nephrol 2008;3:1350-6.